Community First Credit Union of Florida rolled out a new process that makes it easy for members to speak to a senior manager. The new escalation system has resulted in double-digit growth in customer satisfaction. In the age of Apple’s Siri, Google’s Alexa, Microsoft’s Cortana, and Bank of America’s Erica, it’s easy to think that personal interactions have gone the way of the dodo. But AI-based assistants and chatbots can only go so far in resolving member service issues. Live employees handle the lion’s share of member complaints, but what happens when even a manager can’t resolve a situation? 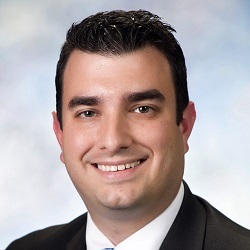 Last year, Community First Credit Union of Florida ($1.6B, Jacksonville, FL) rolled out a new ticketing process that makes it easier for members to speak with a senior manager. That new process has helped the credit union achieve double-digit growth in its customer satisfaction scores and drastically reduce member service comments. The credit union has trained branch and call center managers to watch for certain circumstances and emotional responses from members. Lovelace and his staff take those escalated calls, review the issue with the member, and resolve the issue when possible. How a credit union handles these types of interactions can build loyalty or drive members away. In fact, emotions such as “feeling appreciated, confident, and valued” are top drivers of loyalty, according to Forrester’s US Banking Customer Experience Index 2017. In the study, 90% of “valued” customers were advocates for the brand. Conversely, based on Accenture’s 11th annual Global Consumer Pulse Survey, 52% of customers who switched providers cited poor customer service, and 83% of those customers said “better live/in-person customer service” would have impacted their decision. To improve the overall member experience, Community First has an ongoing initiative to reduce friction across its more than 400,000 member interactions that take place every year. According to Lovelace, the credit union has focused on making sure member service representatives across its 18 branches and call center have access to information that helps them avoid handing off the member to another department. To make all interactions better, Community First has a dedicated process improvement team that works to streamline processes. The credit union has been tracking complaints that come in online or through the mail for many years. But Community First wanted a system to engage with members before they feel the need to lodge a formal complaint. In 2017, the credit union modified its help desk ticketing system to clear the path for escalations. The new system routes escalation requests from branches and the call center directly to Lovelace’s department, which responds to tickets or sends them to a department manager when needed. For Lovelace, who oversees branches and the call center, it’s a powerful tool for addressing issues across both channels. Community First Credit Union of Florida's escalation system takes a three-tiered approach: Identify, Escalate, Resolve. 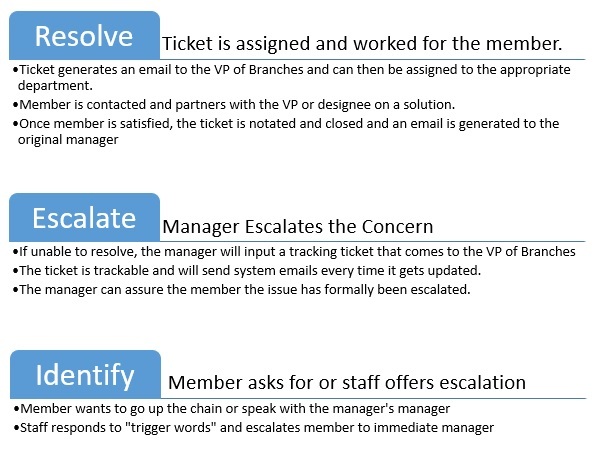 Community First introduced the new ticketing system during a monthly branch manager meeting and conducted training and role-playing to explore ways to diffuse situations, decide when to escalate, and determine how to handle the escalation process. The credit union then rolled out the new process to front-line employees. Additionally, Lovelace says employees should watch for emotion words, too. Language such as “love,” “hate,” “stupid,” and “ridiculous,” suggest the member is having an emotional response. Addressing the issue in an early stage can prevent it from blowing up down the road. Like any major operational change, the new escalation system required technology changes as well as fundamental process changes. Historically, front-line managers in the branches and call center served as escalation points for member service complaints. Now, Community First encourages them to resolve member issues immediately as well as watch for cases that need escalation. Lovelace adds that senior managers feared they would be inundated with escalated customer service issues, but that wasn’t the case. The number of escalated tickets is still less than 1% of all member service issues. Members expect there to be another perspective than the one they’re getting. Community First tracks member satisfaction through a quarterly Net Promoter Score (NPS) index, which measures the willingness of customers to recommend a company's products or services to others and is based on a scale of -100 to 100. Just two years ago, the Quality of Service component of the credit union’s NPS score had dipped to 77, but in 2018 that number climbed to 90, with less than 3% of the comments related to member service. The new complaint resolution system is also generating data to help the credit union analyze common escalations issues and consider ways to improve processes to address them. Lovelace advises other credit union leaders to listen to their staff, as they know what exceptional experiences feel like and can spot broken processes first. As for next steps, Lovelace hopes to enhance the system and route escalations directly to other departments, such as lending, to resolve requests faster and avoid additional hand-offs. But he’s still on the hook for those odd complaints that cross his desk, such as the one from a member who didn’t like the type of bushes planted outside one of the branches.